My name is LindaSue and I'm a marketing project manager. I manage projects by day and by night. Managing work, my family, my household, my life is very fast! We're super excited to go camping this summer! Camping in our household requires bringing the bikes to get around. ​I don't remember not ever riding a bike. We grew up on a farm and had tricycles, bikes and in the winter we rode big wheels in our large basement, do they count? When I was a young adult I was friends with a road racer. She was inspirational with her live life fully each day attitude and ripped body. She taught me how to ride my bike more efficiently. You enjoy riding for the social aspects as well as commuting and occasionally mountain bike. Why is cycling such a great way to explore your community? Riding a bike is the best way to get around. There's nothing like powering yourself across town. You experience nature and your environment instead of being inside a can. Why do you enjoy commuting and/or using a bicycle to pull your kids around vs. a car? Everyone in our family prefers riding over being in a car. To be outside, to experience the world around us, for the positive endorphins, to exhaust the children so they are happier and sleep better :) when we pull the kids to daycare on the way to work the day I feel strong and proud showing them the best way to get across town. How do your kids enjoy their bike ride? Any tips or suggestions for parents wishing to use a bicycle as transportation for their kid(s)? The key to young kids riding their bikes is to be a constant example by being on your bike. We started them in trailers so they saw us riding all the time. Kids know what they see and learn by example. 5. Use flashers by day and night. 10. Take is slow up and down hills as the trailer can jerk a bit and is uncomfortable for kids. 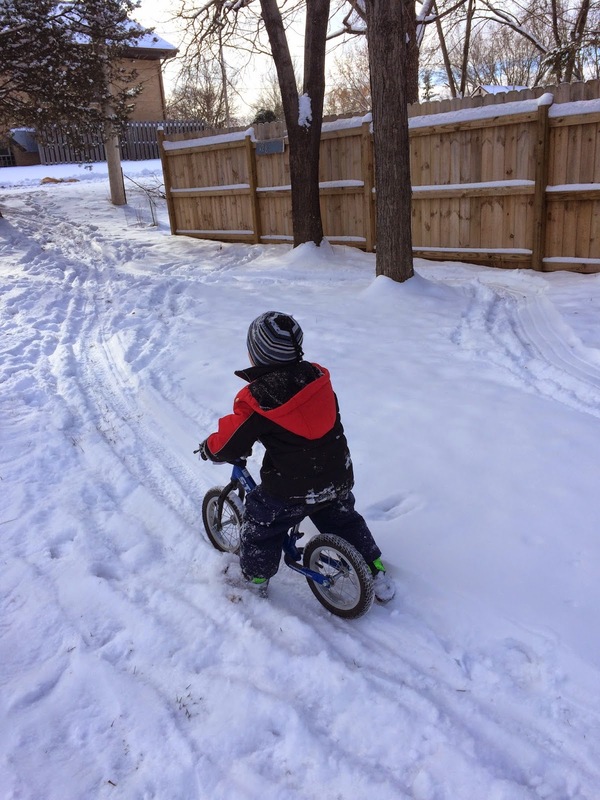 Start them out with a balance bike as soon as they are confident walkers. Adjust the seat height as they get taller so their feet are confidently on the ground but a slight bend to the knee for comfort. Wear helmets always. Do you have any tips/suggestions for those who haven’t commuted by bicycle, but would like to? 1. Begin in comfortable safe environments. 2. Have an experienced rider friend show you the route until you're comfortable on your own. 3. Ask your experienced rider for riding tips. No accidents! One time a short bus cut me off as they made a right turn. Now in busy intersections I watch to make sure someone isn't turning into me. Be observant and wear a helmet! You sometimes mountain bike, what originally inspired you to get on the paths less traveled? If you love being outdoors and the woods, there's nothing like riding your bike through them. My husband inspired me to ride in the woods. What do you enjoy about mountain biking and why should people consider trying it out for themselves? Mountain biking is so relaxing and yet thrilling. You're one with nature. Once you are comfortable with the trail, the intensity turns to peacefulness. Mostly riding bike is freedom. It’s freedom from the gas sucking cars, freedom from traffic, and freedom from other people. It’s my peaceful time with nature. Surly Crosscheck for commuting to work - one summer I rode this bike 2,000 miles to and from work. All-City Spacehorse- my "mama" bike - built in a more comfort upright position for preggers belly - with my second child I rode this bike twice a week to work until my 32nd week of pregnancy. Specialized Rockhopper - single speed for rolling through the woods, lighter weight with less gears, love the lower angled toptube. Timbuk2 bags in every size! You work at QBP, what do you do? Marketing Project Management, I manage business-to-business and business-to-consumer marketing projects for multiple departments including purchasing requests for website advertising. My largest project is the 1,200 page QBP Print Catalog which arrives to bike shops every February. What inspired you to get a job in the bicycle industry? Bikes have always inspired me to be a better person, to be the person I want to be. Being able to commute 20 miles round trip to work gives me such inner strength, such a sense of accomplishment - that I could do anything. The commute recharges my energy level and my soul. 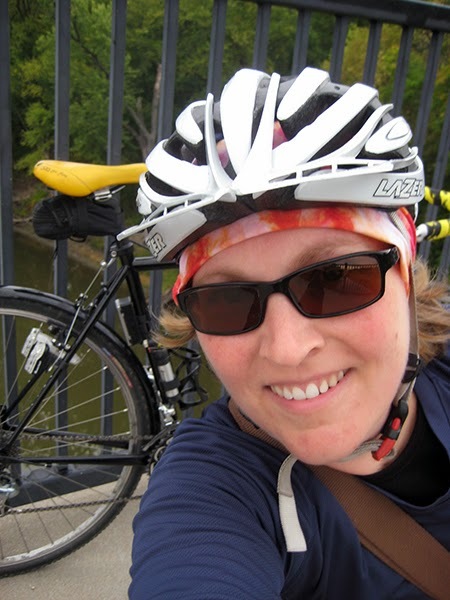 One summer you rode 20 miles round trip, (totaling 2,000 miles) to your job at QBP. What inspired you to do that? QBP offers a company commuter team challenge. ​My friends and I were on a team and they counted on me for miles. Comradery - friendship, competition. A very strong mileage commuting coworker was continually inspiring me. Really a lot of the regular riders - you could tell they were proud of me as I hung my bike up on the indoor bike parking. What are a few things you love about QBP? What I love about QBP is a pretty long list - here's some of it: walking around without shoes or socks if I want to, not wearing makeup, not worrying about my hair, being able to wear hats and casual clothing, flexible schedule, A PURPOSE - helping to save the Earth, a common love for nature, bikes and the great outdoors, the free table where we put items that coworkers pick up to use in their lives – reusing saving the Earth, being around inspirational people, supporting the small business man, bottom line is a lot of FABULOUS coworkers and a common PURPOSE. There’s great strength in taking care of yourself. You can go anywhere riding your bike if you have the time. Exercise will have you living longer, healthier, happier. To save the Earth. To save yourself money. Riding bike is way more fun and faster than walking or running. Bikes are easy to maintain, do not fear. You can be your own mechanic - take classes, learn. Wrenching your bike and being self-supported is an amazing feeling. Make sure you buy your bike from a bike dealer so that it's a comfortable, safely built, and a long lasting fit. 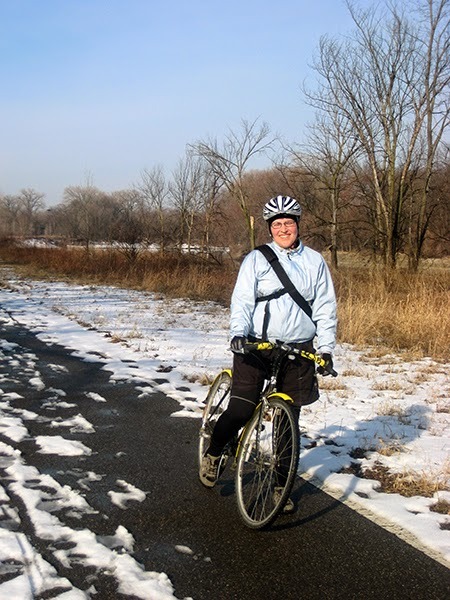 Women in general need more breathable apparel options, especially for large women - they ride bikes too! I dig kids, my kids especially, dancing, being in the woods, camping, photography, playing piano, scissors, hiking, biking, waterfalls, Jazzercise, clocks ticking, chimes, footsteps on a wooden floor, the sound of rain on a tin roof, closing my eyes during an audience clapping and it sounding like a rainstorm, my bike mechanic and lists.